Our Pastor will be happy to visit you to celebrate the Sacrament of Penance if you are unable to come to the church due to illness or weakness. Please call the parish office at (918) 744-0023 to make an appointment. Preparation for and celebration of First Reconciliation is held typically in the Fall of second grade. For more information, contact Becky Holder, Director of Youth Formation at (918) 744-0023, ext. 15. If you are a baptized Catholic who seeks to complete your initiation through the sacraments of Reconciliation, Confirmation, and Eucharist, or if you have been baptized in another Christian tradition and seek full-communion in the Catholic Church, contact the parish office, (918) 744-0023. Penance was instituted by Christ after the resurrection when he breathed on the disciples and said: "Receive the Holy Spirit. If you forgive the sins of any, they are forgiven; if you retain the sins of any, they are retained" (John 20:23). Matthew 16:15-20 also mentions a similar theme where Jesus gives Peter the keys and the authority to bind and loose. The book of James gives witness to the early form of public confession, as well as to its healing power (James 5:13-18). In the early Church, confession and penance were very public affairs. A person, after committing a grave sin, would ask the bishop for penance and would publicly live the life of a penitent (in an order of penitents), meaning exclusion from communion, as well as a strict course of prayer, fasting, and alms giving. After this period, sometimes lasting years, the person was forgiven and allowed to return to normal Christian life. However, there were limitations. For example, this could only be done once in a lifetime. This system had obvious drawbacks, especially when more and more people became baptized after Christianity became legal under Constantine. A new way of celebrating this Sacrament came to us from the Celtic (or possibly Anglo-Saxon) peoples. The monks of the British Isles had a system that lacked both an order of penitents and the requirement of only one penance in a lifetime. They also allowed the sin itself to be kept secret. However, like the methods of the continental and Eastern Church, penance was still public, long, and absolution came only at the end. At some point, confessors started issuing absolution in advance, that is, before the penance was fulfilled. Thus, at this point, we have the beginnings of the current celebration of the Sacrament: confession, absolution, and then doing the penance. Formally, the Fourth Lateran Council (1215) enjoined this method of confession and made it mandatory for Catholics to do at least once a year. The councils of Florence (1431-1439) and Trent (1545-1463) more precisely defined the nature of Reconciliation, even though the practice goes back to the earliest days of the Church and Jesus himself. The emphasis of the Sacrament was expanded with the Second Vatican Council, which emphasized reconciliation and amendment of life and allowed the option of public services of penance (but these must always include auricular (meaning private) confession). However, the basic theology behind the Sacrament has remained the same, namely reconciliation with God. The Catholic Church teaches the primary elements of the Sacrament are 1) contrition, 2) confession, 3) absolution and 4) satisfaction. The sinner confesses his sins and vocalizes his internal repentance. The priest then gives penance and through the power of his ordination, pronounces the words of absolution. The Catholic Catechism, quoting from the Council of Trent, defines contrition as: "sorrow of the soul and detestation for the sin committed, together with the resolution not to sin again" (#1451). In other words, we have to be sorry for our sins and genuinely not want to do them again. We can't enter into the Sacrament confessing adultery, knowing full well that we've penciled in a date with an illicit lover next week. We will fall, perhaps frequently, but we have to intend not to sin and mean it. The Catholic Church recognizes two types of contrition, perfect and imperfect. Perfect contrition means that we are sorry for our sins because we love God above all else and recognize that we've offended him. Imperfect contrition is a sense of being sorry that comes from imperfect motives, i.e. fear of hell or recognizing how awful our sin is. 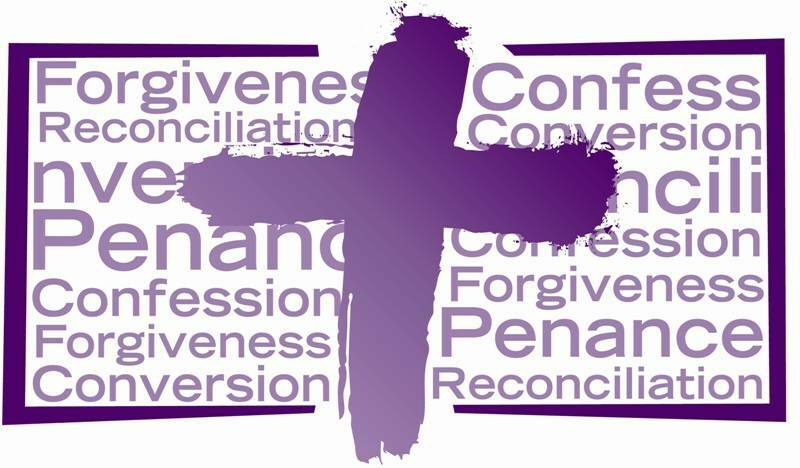 Even imperfect contrition is enough for us to receive forgiveness in the Sacrament of Reconciliation. However, all forgiveness requires genuine sorrow. This is simply taking responsibility for our sins. By giving voice to our sins with sincere sorrow, we own up to what we have done wrong. Confession in the Catholic Church is not like the politician's "mistakes were made." On the contrary, it is an owning up to our own responsibility in our sinfulness by naming specific shortcomings. We must tell the priest all the mortal sins we have committed since our last confession. We only compound our sinfulness by lying about our sinful behavior. Before confession we are expected to do an "examination of conscience," where we reach deep into our souls and recall the sins we have committed. It is helpful to do this everyday, so as to not forget the sins we committed on Monday by the time Confession comes around on Saturday. The examination process should be honest and open, and done in a spirit of prayer as we recall our genuine sins. We must rely on our well-formed consciences to guide our examinations. In confession, we speak of ourselves in the first person. Catholic doctrine teaches that if a person commits a mortal sin (i.e. willfully and deliberately does something gravely sinful), he must go through the Sacrament of reconciliation in order to receive forgiveness and receive the Body and Blood of Christ at communion. In the Catholic Church we confess our sins to a priest. Why is confessing to a priest necessary? 1) Our mortal sins not only cut us off from God, but also from the Church. Sin does not happen inside a vacuum. What we do has consequences outside of ourselves, even if it is just weakening the bonds of charity with our fellow Christians. Even private, secret sins lead to spiritual degeneration, which affects our brothers and sisters. Confession to a priest recognizes and heals this dimension of sin. 2) It is the method God uses to forgive his people. Since the beginning, confession of sins has never been just between the Christian and God, but between the Christian and God and the Church. Confession restores us to God and the Church when we act wrongly and willfully cut ourselves off from the love of God and his Church. Jesus gave the Church power to forgive or retain sins and this is how the Church has exercised the ministry of forgiveness. 3) Confession to a priest is a natural impulse. Look at all the confession that goes on in the world: to bartenders, psychologists, reporters, friends, and even total strangers. In the confessional, a person is forgiven in absolute secrecy. The priest is forbidden under pain of excommunication to divulge anything heard in a confession. 4) Confession to a priest keeps us on the straight and narrow and helps us grow in holiness. The priest, in the confessional, keeps us accountable for our actions. After the confession, the person will make an "act of contrition" which is an outward prayer in front of the priest that affirms the person's inward state of being sorry. Then the priest will give counsel and assign a penance. Finally, the priest says the words of absolution and we are forgiven, a cause of great rejoicing! The priest is not the source of forgiveness, God is. However, the priest, ordained in valid apostolic succession, acts as God's ambassador, and is the instrument God has chosen to use by which he forgives our sins. The absolution remits the guilt and the eternal punishment of mortal sin. So, why does the priest assign us penance and why is this necessary? When we sin, we offend God and his justice. An offense against justice requires some kind of satisfaction. It's like when a person steals, even if he is completely forgiven, justice requires him to make reparation. The Bible is full of examples of temporal punishment for sin: Adam and Eve, David, Solomon, etc. Penance, then, is our way of making reparation for our sins. This is not earning our salvation since we are not in danger of hell after the absolution. It is simply making reparation to God for our wrongs we have done. The Catholic Church does not burden people with excessive penances and the priest usually assigns a few prayers or an act of charity. The early Church, as noted above, strongly believed in the concept of penance. The Catholic Catechism explains penance well: Many sins wrong our neighbor. One must do what is possible in order to repair the harm (e.g., return stolen goods, restore the reputation of someone slandered, pay compensation for injuries). Simple justice requires as much. But sin also injures and weakens the sinner himself, as well as his relationships with God and neighbor. Absolution takes away sin, but it does not remedy all the disorders sin has caused. Raised up from sin, the sinner must still recover his full spiritual health by doing something more to make amends for the sin: he must "make satisfaction for" or "expiate" his sins. This satisfaction is also called "penance" (#1459). The Sacrament of Penance is a beautiful sacrament through which we are reconciled to God, ourselves, and our neighbors. Remember the words of St. Paul, “God is rich in mercy; because of His great love for us, He brought us to life with Christ when we were dead in sin” (Eph 2:4).